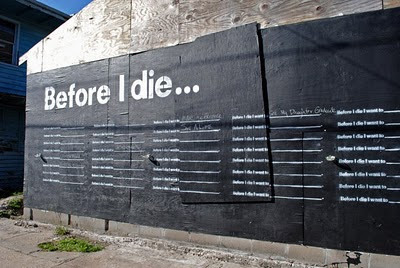 Artist Candy Chang has installed this thought provoking piece in new Orleans. 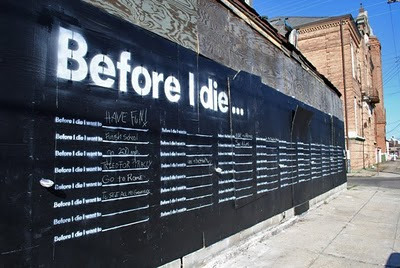 "With a lot of help and support from old and new friends, I turned the side of an abandoned house in my neighborhood into a giant chalkboard where residents can fill in the blank and remember what is important to them in life. It’s also about turning a neglected space into a constructive one where we can learn the hopes and aspirations of the people around us. It turns out this entire process has been a great lesson, experience, and project in itself – more on that later. If you’re in New Orleans, stop by the corner of Marigny and Burgundy (900 Marigny St) to add your thoughts to the wall and see what matters most to your neighbors."